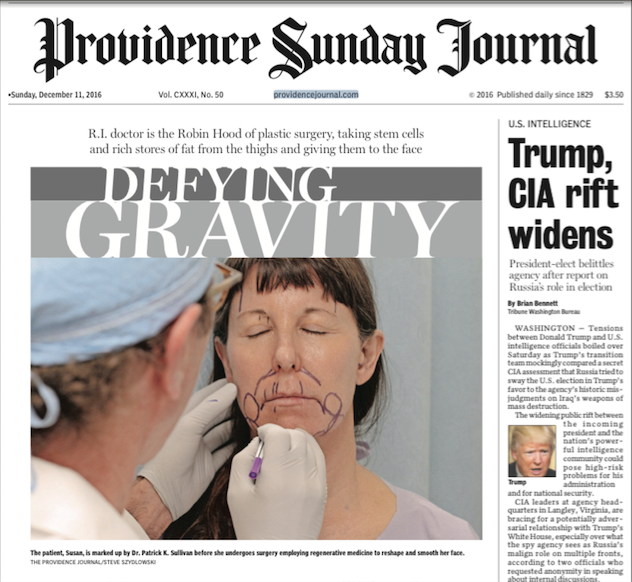 PROVIDENCE – As his team prepares the operating suite for what will be hours of the most delicate surgery on the most distinctive part of anatomy, Dr. Patrick K. Sullivan stands in an adjacent room, gloved hands drawing purple lines on his patient’s face. Susan, 59, has traveled from the West Coast to avail herself of the doctor’s exquisite expertise, which is informed by his longstanding passion for painting and sculpture. She has come for so-called facial rejuvenation — a face-lift, in lay terms. Like other types of surgery, significant advances have been made in recent years, thanks to research. And one of the pioneers is Sullivan, division chief of aesthetic surgery and associate professor of plastic surgery at the Warren Alpert Medical School at Brown University. In his work, he applies the frontier science of regenerative medicine, in which the body rebuilds itself. “What do you feel we are going to be able to do for you?” Sullivan had asked Susan two days before, when, after an extensive email and telephone correspondence that satisfied both that they should meet in the operating room, she visited his office. “I’m hoping that my jowls will be minimized and the creases will be minimized and I’ll get back to having my previous neckline,” Susan said. Susan, a retired public-policy analyst for a federal agency, agreed — but age, she said, had robbed some luster from that beauty. Susan laughed. She pointed just below a cheekbone. The surgeon outlined his strategy. 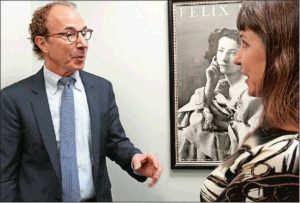 Unlike the traditional face-lift, which relies on stretching skin, a technique that can produce disappointing results — what has been called the “alien” or “frozen” look — Sullivan’s surgery involves injections of fat and its associated stem cells, which are at the heart of regenerative medicine. Body, refresh thyself. Using tiny, custom-built tubes known as cannulas, he would harvest the yellowish flesh innocuously from her thighs, leaving no trace, no scars or deformities. Susan related the journey that led her to Rhode Island. It began in Las Vegas, where her West Coast plastic surgeon and his staff heard Sullivan present a paper at a meeting of the American Society for Aesthetic Plastic Surgery. They were impressed. So was Susan when they informed her of the marvels of regenerative medicine. And there are worse things that are said when things go wrong. Now, as Sullivan completes the lines on his patient’s face that will define his sculpture, Susan’s trust is about to be tested. 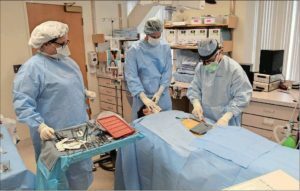 In the operating suite in rental space at Rhode Island Hospital, the doctor’s team stands ready. Sullivan was no child of privilege, not someone born with a medical pedigree — unless you count his father, who aspired to be a doctor but was forced to leave college when the tuition became too burdensome. So Dad worked the Minnesota iron mines and other blue-collar jobs. He and his wife, a schoolteacher, had nine children. Sullivan was the last. The young boy developed an interest in painting and sculpture — and then came a coincidence that would unite that childhood passion with a different if distinctly related calling. He was in second grade when his oldest brother came home from medical school with an anatomy text, which his parents permitted him to read. Curious to see firsthand what lay hidden beneath skin, he performed his first dissection: of a fresh-killed chicken, on the kitchen floor. Sullivan graduated from St. John’s University in Collegeville, Minnesota, in 1975, and from Mayo Medical School in 1979; and then, after a general surgery residency, completed three years study of head/neck surgery and otolaryngology at the University of Colorado, where he decided on a career in plastic and reconstructive surgery. Following a residency at Brown, where he would later be professor, Sullivan trained for almost a year with distinguished plastic surgeons in Zurich and Paris, where he frequented the Louvre and Musée Rodin, two of the world’s great art museums. “The combined study of art and science has enabled me not to just talk about an artistic approach for each patient but to actually bring about a very natural enhancement for them in the operating room,” said Sullivan, who lives in Barrington. Today, Sullivan lectures and publishes regularly, influencing others beyond Rhode Island. The monitor beeps. Sullivan’s team is quietly busy. Susan lies on the table, sedated but not with general anesthesia, which would have required intubation, which carries risk. Local anesthetic will block pain, and the sedation mix will erase memory, but avoid the potential complications and often difficult post-operative recovery from the lingering effects of general anesthesia and a breathing tube inserted into the trachea. Dr. Heather Panaro trained at Massachusetts General Hospital and is a clinical assistant professor of surgery at Brown. Nurse Beata Sochacka and technician Lynn Rainey are also part of Sullivan’s team. 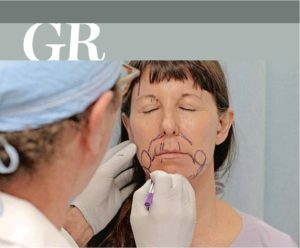 One pinprick at a time, the surgeon pulls a small volume of fat with associated stem cells from Susan’s thigh and places it, one injection at a time, beneath the creases on her cheeks and jowls, as Sullivan mapped in purple preoperatively. Rainey, who has been with Sullivan for almost two decades, tracks the surgeon’s moves. The surgeon is similarly respectful of nerves. During his many hours dissecting cadavers in a Brown lab, he perfected his knowledge of fine facial anatomy. About an hour in, Sullivan moves higher on Susan’s face. He will use a scalpel for the first time, cutting through her scalp to reach the tissues beneath her forehead, which he will pull up, or lift. “Even though we’re not doing eyelid surgery,” Sullivan says, “we’re going to suture the eyelids closed to protect them, since we’re bringing up all this instrumentation. We don’t want corneal abrasions.” He will not cut near her eyes, but the tools he will use will repeatedly pass by them, so he exercises an abundance of caution. Sullivan cuts into her scalp, behind her hairline but avoiding the follicles. The incisions will not be seen. In preparation for tightening the forehead tissues from within, Sullivan inches along the surface of her skull with an endoscope; the scope-tip camera sends an image to a monitor to help guide him. The sound of metal on skull is audible, and perhaps properly described as unsettling, at least to the layperson. Sullivan brings his expertise to a variety of patients, including children born with craniofacial, cleft palate and other deformities who require reconstructive surgery; with some, he incorporates regenerative medicine, as outlined in a recent paper, “Autologous Fat Grafting in the Pediatric Population,” submitted to Plastic and Reconstructive Surgery, Journal of the American Society of Plastic Surgeons. He frequently travels abroad, including with the Operation Smile and Smile Train programs, to provide free care to needy children. He teaches techniques developed by him and others at foreign hospitals and universities where such expertise is lacking. Still, elective work remains a pillar of his practice. Insurance ordinarily does not cover this type of surgery and, depending on how extensive it is, the cost can range from less than $10,000 to about $30,000. Like other plastic surgeons, Sullivan offers payment plans. His success has brought prominent people to him, including, this fall, professional golfer Brad Faxon. The surgeon completed upper eyelid rejuvenation for Faxon, now a Fox Sports golf analyst. Faxon applauded the results. In assessing a candidate for facial rejuvenation, Sullivan considers input from a candidate’s cardiologist, internist and other professionals. Some, Sullivan said, are professional. Before Susan visited Sullivan’s table, she showed him photos of herself going back decades to help him understand the look she wanted. The two discussed her motivation. Several weeks after her facial rejuvenation, Susan returned to Sullivan’s office. The bruising, swelling and pinpricks were gone, along with all other traces of surgical trauma. Her husband, who had expressed qualms before the surgery, was delighted, Susan said. “You’re back, the sutures are out, what does it feel like?” Sullivan said.